James Reid and Nadine Lustre (left frame) shot scenes of On The Wings of Love in San Francisco; Alden Richards (middle) almost saw Maine Mendoza (Yaya Dub) in the August 12 episode of Eat Bulaga! Here are the significant events in the ratings game from August 9-12, 2015, according to the latest data gathered by AGB Nielsen Philippines from Mega Manila households. Eat Bulaga! continued to break records during the given period. In fact, it has now scored the highest rating for 2015 with its August 12 episode, which featured the AlDub tandem’s near-meeting. 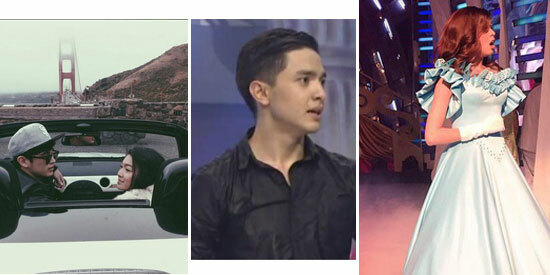 Alden Richards almost saw Maine Mendoza (Yaya Dub) when she performed in the studio of Eat Bulaga. The episode got 36.1%, higher than GMA-7’s special Lenten presentation of The Ten Commandments. The high rating of Eat Bulaga (36.1%) was more than four times the rating of It’s Showtime for the day: 8.8%. The other episodes of Eat Bulaga during the given period also ranked high. The August 10 episode placed on sixth place, while the August 11 episode was in the No. 4 slot. GMA-7 also led primetime with Pari ‘Koy, its religion-themed drama starring Dingdong Dantes. This was after several weeks when ABS-CBN’s Nathaniel and Pangako Sa ‘Yo alternated on top of the charts. Pari ‘Koy will end on August 21 and will be replaced by Marimar, featuring Megan Young and Tom Rodriguez. The Kapuso Network was also successful on August 9, Sunday, with the pilot of its variety program Sunday Pinasaya. The new Sunday noontime show got a rating of 22.7%, much higher than ASAP’s 11.5%. Sunday Pinasaya, which replaced Sunday All Stars, features Marian Rivera, Ai-Ai delas Alas, Alden Richards, Jose Manalo, Wally Bayola, Julie Ann San Jose and other comedians. Wowowin also performed well in its earlier timeslot, as the Kapuso show hosted by Willie Revillame registered 22.3%. Four new primetime programs debuted on the given period. Three were from GMA-7: Reply 1997, Beautiful Strangers and My Faithful Husband. ABS-CBN also aired the pilot of its new show: On the Wings of Love. Reply 1997 is a nostalgic Korean drama that airs on early primetime. Its August 10 episode got 12.6%, higher than Pasion de Amor’s 10.1%. Beautiful Strangers was the replacement for Let the Love Begin. The pilot episode of the heavy drama that stars Lovi Poe and Heart Evangelista scored a TV rating of 21.4%, slightly lower than Pangako Sa ‘Yo’s 22.1%. Lastly, My Faithful Husband’s pilot episode earned 17.6%, against On the Wings of Love’s 19.3%. My Faithful Husband is an infidelity-themed drama that stars Jennylyn Mercado and Dennis Trillo. It is the replacement for The Rich Man’s Daughter. On the Wings of Love is also a new show. The Kapamilya romantic series that stars James Reid and Nadine Lustre replaced Bridges of Love.